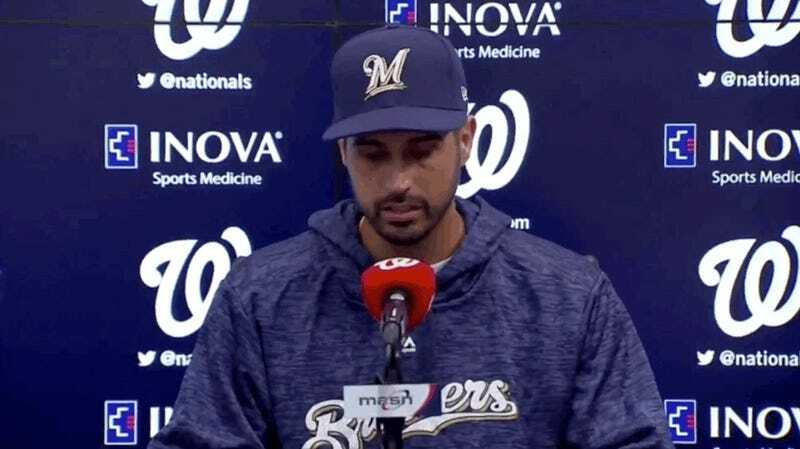 Gio González Takes A Break From Weeping To Reassure Brewers PR People: "But I'm Happy! I Am Happy." The best moment in there is at about the 0:56 mark, when González starts to crumble while talking about soaking in his final moments as a National. When Gio looks all the way to his right there to reassure the room that he’s happy, he’s looking directly at Milwaukee’s PR staff, hidden off camera. Yikes! Gio had some good years in Washington—he won 21 games and finished third in Cy Young voting in 2012; he won 15 games last season, with a strong 2.96 ERA—and despite all his baffling inconsistency, he’s been a pretty durable and reasonably successful presence in the Nationals rotation for nearly seven seasons. His crummy 2018 season—a 1.531 WHIP and 4.24 FIP across 27 mostly frustrating starts—is pretty much par for the course for everyone not named Max Scherzer on this infuriating Nationals team, but even Nats fans will be pulling for Gio in Milwaukee.